Which sentence contains a pronoun used as an adjective? Practice identifying pronouns as adjectives with this printable activity. Students will be asked to complete the worksheet by reading through the given sentences and circling each sentence number that has a pronoun used as an adjective. 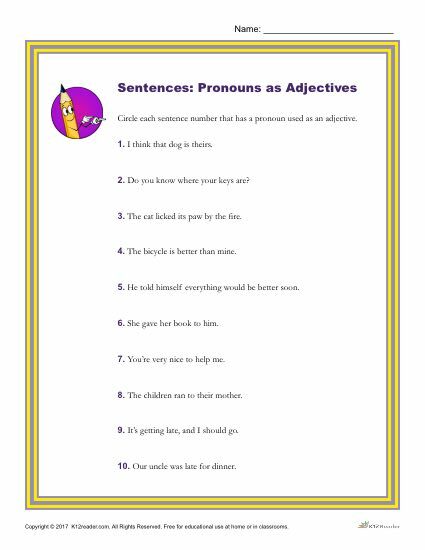 This pronoun worksheet is ideal for 5th – 7th grade students focusing on adjectives, pronouns, and parts of a sentence. It is great for reading and writing skills practice both at home and in the classroom. Click the link below to download and print the worksheet.